The dark side becomes you. Be the envy of your fellow Star Wars fans! Cufflinks feature Darth Vader's lightsaber and the Galactic Empire emblem. Display your love for the Star Wars universe and dress in the style of the dark side with these beautiful Star Wars Darth Vader Lightsaber Sterling Silver Cufflinks! One features the Dark Lord's lightsaber, while the other is in the shape of the emblem of the Galactic Empire. 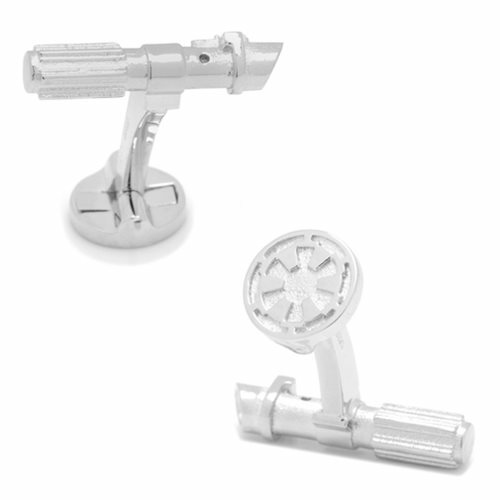 Measuring about 7/8-inches wide x 1/4-inches tall, they're made of sterling silver, so you're sure to be the envy of your fellow Star Wars fans!